Something that I am really keen to do this year is to write some tutorials for this blog. As you know, I normally give credit for my makings to some website or other, but every now and then I strike out and create my own pattern. A while back, when I made a dolls nappy for Rascal, I found several doll's nappy tutorials but they were all for dolls of a specific size. 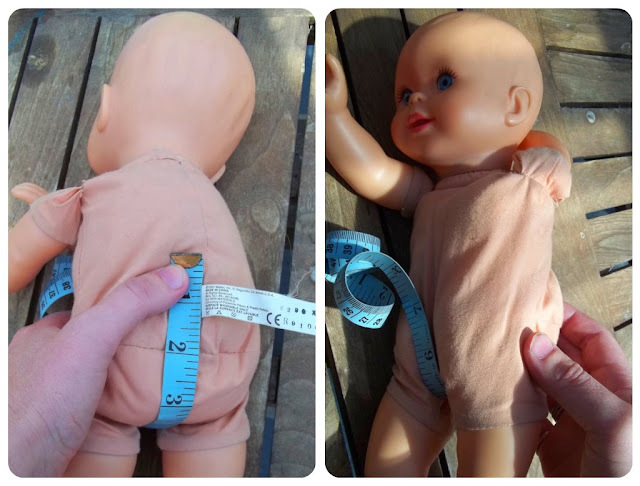 I thought I would write a tutorial with instructions on how to make a nappy tailored to your doll's exact dimensions, because lets face it, not every doll is the same size. Measurement 2 is taken between the legs is the height that you want the nappy at the front to the back. For my doll this measurement is 8 inches. 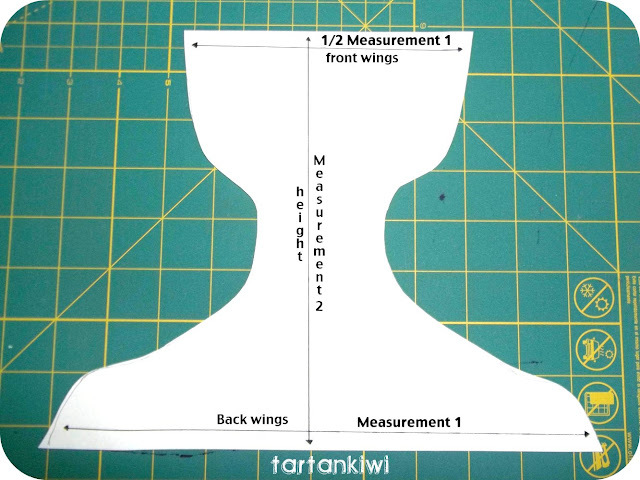 For the front wings of the nappy, use 1/2 of measurement 1-For my nappy this is roughly 5.5 inches. For the height of the nappy use measurement 2- My Doll has a height measurement of 8 inches. Halfway down the height comes the narrowest part of the nappy. Remember that most dolls don't have that much room between their legs so you don't want too much bulky fabric there. My nappies are only about 2.5 inches wide between the legs. Now that you have measured all these points, its a question of joining the dots. Here is a downloadable version of my template. Feel free to use it or to alter it to fit your particular doll. Note: I did not add any extra seam allowances this time that I made the nappy, but the previous times I did. Both nappies fit the dolls just fine. I tell you this to illustrate that you don't have to be totally accurate in your measuring! That said, I think I prefer the extra width of the wings which results from adding seam allowances. All seams in this tutorial are 1/4 inch. Tip: if you are unsure of your measurements don't use your good fabric for your first attempt. Sew around the the edges being careful to leave a gap a 2-3 inches wide through which you can turn the nappy right way out. Clip and notch the edges, being careful not to cut through your seams. Sew a strip of the loops part of the velcro to the outside of the front wings of the nappy. Sew a square of the hooks part of the velcro to the inside of both of the back wings of the nappy. Ta da, your nappy is complete! Stand back and admire your handiwork! If anything is unclear, please don't hesitate to ask. If anybody has a go at making one of these, I'd love to hear how you get on. How sweet it is.. Thank You for sharing-- every little girl will want one for her doll!! this is so cute! i will have to send this post as a link to my sister, her little boy is into his doll since he found out he's going to be a big brother soon. i'll actually start following your blog, seems like you've got some cool projects going on i don't want to miss! I can't see any conditions for using your patterns/tutorials - is it permitted for home sewists to make them to sell in small quantities (with attribution of course)?